Gold is one of the most precious metals in the world. 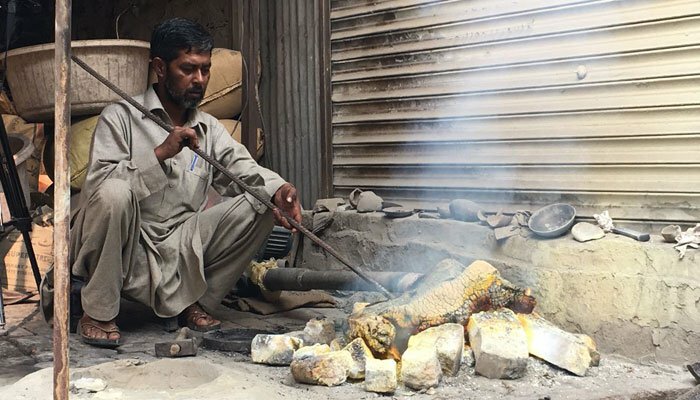 Yet 60 tolas of gold go into the dirt every month in the Sarafa Bazaar of Peshawar. Local “nayariyas” are workers who extract metals from dirt/sand. During the process of making jewelry, gold particles fall down on the ground and nayariya use old methods to convert it into gold. 125 nayariyas are currently working in three factories in Khyber Pakhtunkhwa. A nayariya said that we take sand from workshops where gold jewelry is prepared and we give Rs. 5,000 to 10,000 for this sand. Pappu Saeen is a nayariya who is “blessed” with the sight to spot dirt/sand containing gold particles. He said that this profession started 50-60 years ago when people were trained in this skill. Pappu Saeen is a jewelry shop owner himself. He said that we give this gold to our apprentices to practice on. Apprentices practice jewelry making on this gold to learn the art of gold crafting and designing. He further added that jewelry is made from these particles, which is then sold in the market. He added that they go to different areas in KPK and in FATA to collect this dirt. Around Rs. 100,000 is saved daily by collecting the gold particles from the dirt in Peshawar alone. If people like Pappu Saeen don’t work on collecting dirt for the purpose of extracting gold then over Rs. 3 million will go wasted every month. He said that only a handful of people know about this process. According to Pappu, they are contributing to the economy because they are saving millions of rupees going down the drain without anyone knowing about it. The sand containing gold is separated from the waste and dried. Graphite, borax, and caustic soda are added to it and mixed. The whole thing is then heated up to 6000°F or 3315°C . The molten mixture is then poured on the ground; the heavier and precious metals (gold and silver) settle down while other useless material rises to the surface. The mixture of gold and silver is then heated again to separate the gold from silver. The real “Alchemist” Pappu Saeen.